The Red Sox have re-signed corner infielder Brandon Snyder (pictured) to a minor league deal, according to the Pawtucket Red Sox official website. The deal also includes an invitation to spring training. The team also lost three minor league relievers this week. Left-hander Ryan Rowland-Smith inked a minor league deal with Arizona, while righties Brock Huntzinger and Anthony Carter signed on with Baltimore and San Diego, respectively. Snyder, who turns 27 on Saturday, appeared in 68 games with Triple-A Pawtucket and 27 at the big league level. While he has previous professional experience at catcher and in the outfield, he was used almost exclusively at the infield corners last season, with the exception of two innings in the outfield during a blowout victory in September. Snyder hit .261/.332/.454 for the PawSox and went 9 for 50 with two home runs in the majors. He currently projects to begin the season as the starting first baseman for PawSox. The three departing pitchers played key roles in Pawtucket's success in 2013. Rowland-Smith was very effective as a lefty out of the PawSox bullpen, posting a 1.55 ERA and 0.994 WHIP while striking out 45 in 52 1/3 innings. He reportedly will receive an invitation to Diamondbacks spring training as part of his deal, per Jerry Crasnick of ESPN.com. Huntzinger departs the Boston organization after 189 appearances dating back to 2007, when he was a third-round draft choice. The 6-foot-3 right-hander's career seemed to be stagnant in early 2012 until he was rejuvenated by a move to the bullpen. In 49 appearances split between Pawtucket and Double-A Portland, Huntzinger had a 1.89 ERA and 62 strikeouts in 68 2/3 innings. Carter led all Red Sox minor leaguers with 24 saves, and his 11.4 K/9 rate was the best among those with at least 60 innings pitched. 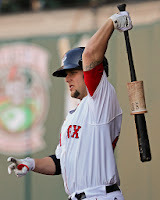 Keep posted on the status of all of Boston's minor league free agents on the SoxProspects.com Off-Season Depth Chart.